The #1 thing I look for when shopping for new kitty kitsch is anything tortie-related, of course. Easier said than done. Calicos, tabbies and meezers are all quite plentiful on store shelves but anything with a tortie on it is scarce. I'm all about the thrill of the hunt though, and I put together a gift guide of things I've found to help make shopping for fellow tortie fanatics a little easier. Disclaimer: Some of these are affiliate links which means if you click on one and buy something Mudpie gets a little money for her piggy bank! Yay! How cool that you featured Binga's mug! Thank you! If you think finding tortie items is hard, try looking for things with Somali cats on them! These are all too purrfect! I like to get my parents stuff with all of their kinds of kitties. They have a whole rainbow of cats, including brown tabby, orange tabby, black and white, calico, and a dilute tortie. That last one sure is impossible to find. But you give so many lovely options here! Thank you so much for sharing this! Thanks, Melissa. Love them all! I love the tray!! It looks just like Amarula when she shows her belly! I'm so honored you included me! Thank you! My girls would be very happy to be in this collection! OMC! Those are the BEST Tortie gifts ever! Great tortie collectables. OK, when TW wants to order something with ME on it, she designs it on Zazzle or VistaPrint or one of the other self-designing places. That was she’s sure to get ME and not a cat that looks like me but might not be stunning. What pawesome gift ideas! We especially love the necklace. 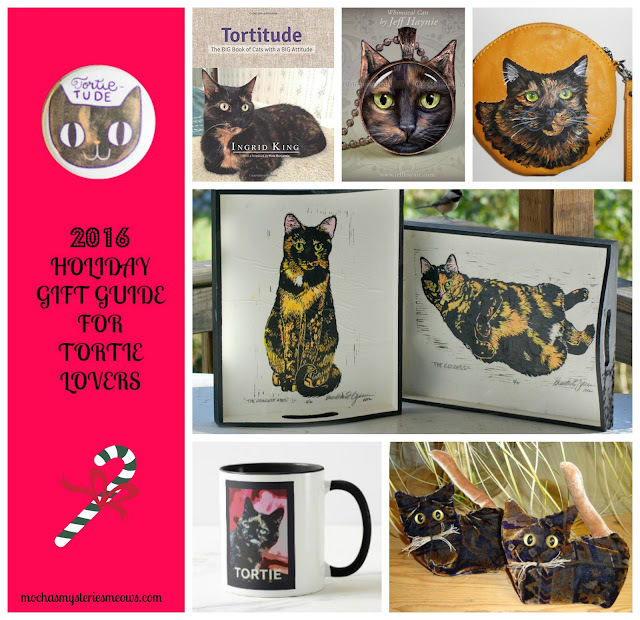 Great roundup of Tortie gifts! I think there should be lots and lots of Tortie items everywhere. Just sayin! Well, Tortie colors ARE kinna complicated... An Beins are kinna simple sometimes.